This is an oddly curated anthology. On the face of it a programme of Saint-Saëns and Poulenc choral works may well work in theory, but I’m not sure this trilogy of pieces culled from the Argo back catalogue sits comfortably together. In their original incarnations, Lopez-Cobos’ Gloria was paired with Bizet’s rarely heard Te Deum; Poulenc’s Christmas Motets with their Easter equivalents and Stravinsky’s Mass while the longer Saint-Saëns Messe à quatre voix occupied a disc to itself. While the original black discs could be justified aesthetically, I feel these two concise masterworks of Poulenc’s maturity here make strange bedfellows for Saint-Saëns’ youthful, rather lumbering Mass. The performing forces required for each work couldn’t be more diffuse while there is also something of a lack of uniformity in the recorded sound. The highlight of this disc, from my perspective at least, is Simon Preston’s loving account of the same composer’s Four Christmas Motets (aka Quatre Motets pour un temps de Noël) with the Christ Church Cathedral Choir. This recording is 45 years old now but still sounds freshly minted. The acoustic of Merton College provides a glowing ambience; the boys’ voices in the upper lines lend an ethereality to these works that adult female voices cannot match. Inevitably Preston prepared this choir wonderfully well – there is some tentativeness among these young voices but that actually suits the pieces: O Magnum Mysterium is bathed in an eerie haze; the concluding Hodie Christus natus est is perfectly pointed and sprightly. The motets here provide a delicious interlude. Saint-Saëns 45-minute Messe à quatre voix was an apprentice work, written when the composer was 21. It is characterised by fastidious craftsmanship, exceptional in one so young, and by great respect for the past: it is said to have been modelled upon one of the Messes Royales (1660) by Henri Dumont (1610-1684), unison works with a strong leaning towards plainchant. The (uncredited) note implies that the piece is characteristic of the then contemporary trend towards composing settings of the liturgy for concert rather than religious purposes; indeed in its original guise a full orchestra was involved. However the work’s dedication to a priest, the Abbé Gabriel, actually suggests quite the opposite. As does the way the work sounds in this ‘reduction’ with organs. It is unlikely an ‘innocent ear’ could identify the composer from a first encounter with the opening three panels of this Mass. The balance of the work is cumbersome, starting as it does with a monumental 14-minute Kyrie eleison, which proves to be of equal length to the Gloria and Credo combined. At times the grand orgue seems to fulfil something of a concertante role, but much as I love the mature Saint-Saëns I found much of this music to be leaden and austere, despite a vivid recording and the best efforts of Donald Hunt’s Worcester forces. In fact both of the last two sections contain moments that presage this composer’s mature (and mercurial) personality; firstly in the Sanctus which begins as a march but mutates into a rather vulgar waltz, while the Agnus Dei also provides momentary glimpses of the mature composer. The choir sings well throughout, though there are occasional entries where ensemble is ragged; the soloists are competent rather than outstanding. Roy Massey’s work on the Grande Orgue is certainly impressive. From time to time the old Argo label used to throw up examples of rare repertoire that would delight and encourage the listener to delve a little deeper into a particular composer’s canon. For me at least Saint-Saëns’ apprentice Mass doesn’t press that particular button; while the writing is assured and well-crafted for a 21-year old, it actually sounds rather ‘heavy’; a worthy work rather than an inspired one. In all then, I found this compilation to be something of a curate’s egg. 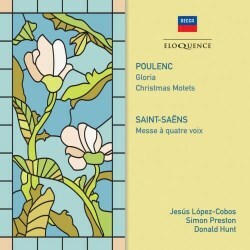 A neo-classically inclined reading of Poulenc’s Gloria, a sympathetic account of his Christmas Motets and (from my perspective at least) a rather stodgy Mass which I am sure will be snapped up by Saint-Saëns’ many devotees regardless of my caveats.